TurboCAD Professional is for experienced 2D/3D CAD users. Get hundreds of drawing tools, an optional AutoCAD®-like 2D drafting interface with command line and dynamic input cursor, 3D modeling tools, photorealistic rendering and extensive file support. Design, modify, present and document in an integrated fashion. 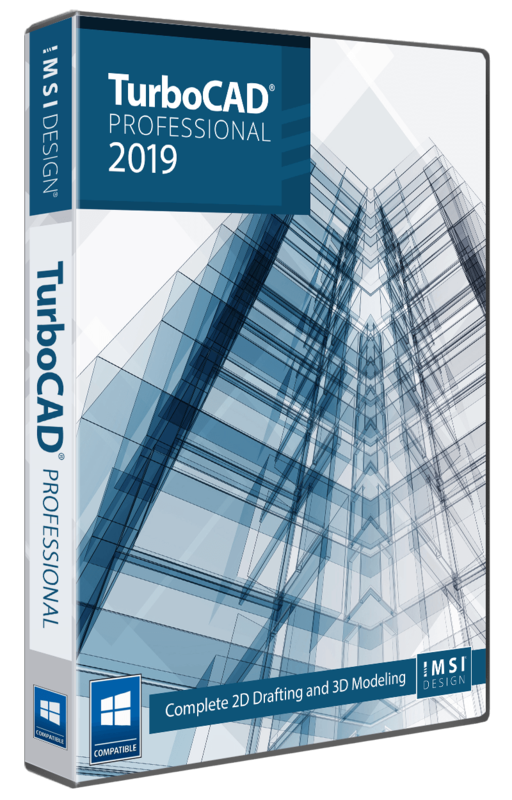 TurboCAD Professional 2019 is for experienced 2D/3D CAD users already familiar with AutoCAD® or AutoCAD® LT looking for a powerful alternative. It includes all of the 2D drafting, 3D surface modeling, photorealistic rendering, and extensive file support of TurboCAD Professional 2019. TurboCAD Professional 2019 also includes an AutoCAD®2019-like 2D drafting interface option with command line and dynamic input cursor that simplifies the transition from AutoCAD®2019. Plus, additional professional features are included in TurboCAD Professional 2019 to enhance productivity and interoperability. AutoCAD®2019-like 2D drafting interface option with command line and dynamic input cursor that simplifies the transition from AutoCAD®2019. Expanded File Sharing Options including AutoCAD®2019 .DWG & .DXF, SketchUp .SKP, .STL, 3MF and FBX for 3D Printing, & more! TurboCAD Professional 2019 is delivered in a 64-bit version to take full advantage of your hardware’s available computer memory to load, process, and render CAD files. A 32-bit version is also available if required by your hardware. Microsoft Windows 10, Windows 8* 64-bit, Windows 7 (64-bit), Vista (64-bit) – 8 GB RAM.